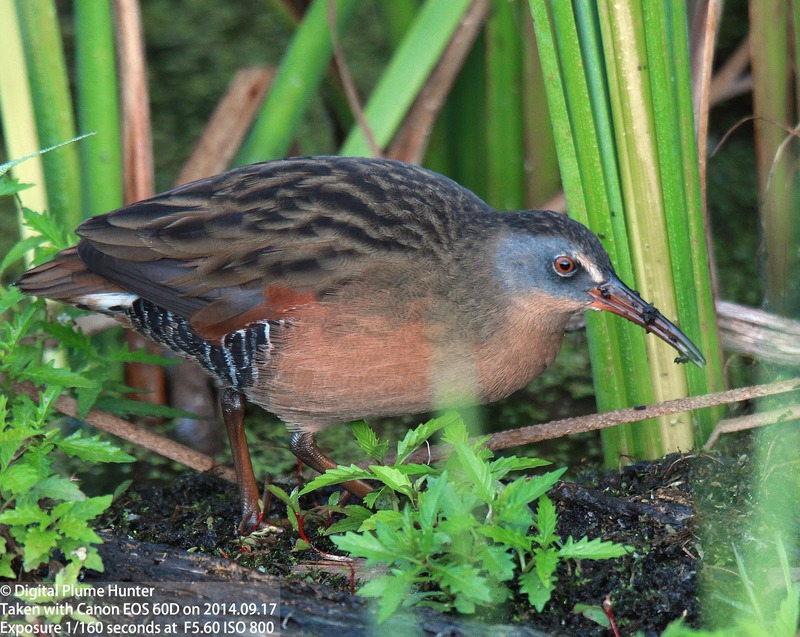 The Virginia Rail is a medium-sized rail of freshwater marshes. At about 10" in size, it is midway between the smaller rails (Black Rail and Sora at 6") and the larger rails (Clapper and King Rails; the latter coming in at a whopping 19"). 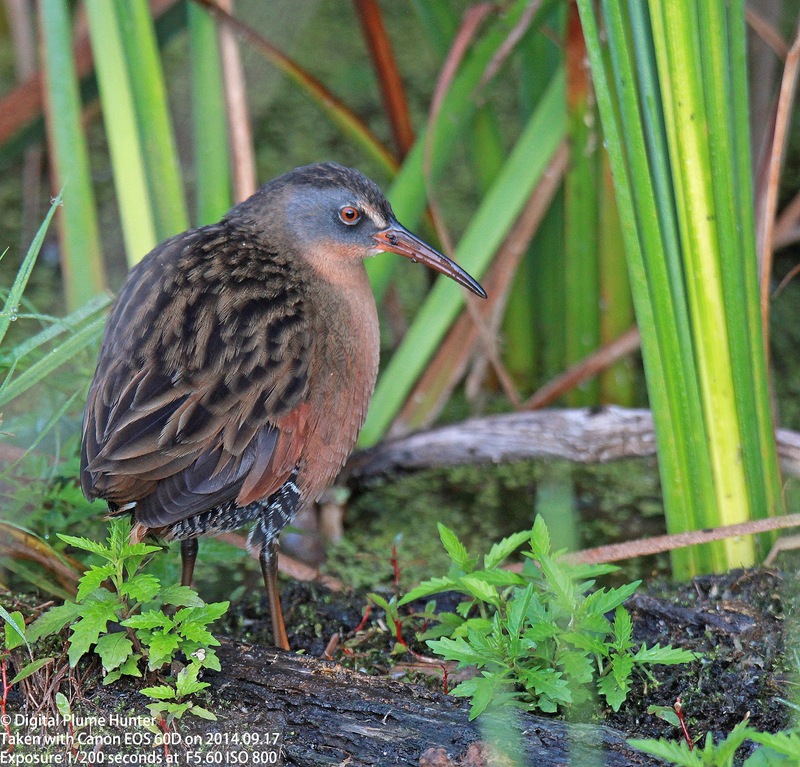 Cryptically plumed and secretive in its habits, the Virginia Rail is rarely seen (a fact attested by these frequently obstructed photographs) -- although in Spring, their vigorous vocalizations commonly betray their presence. 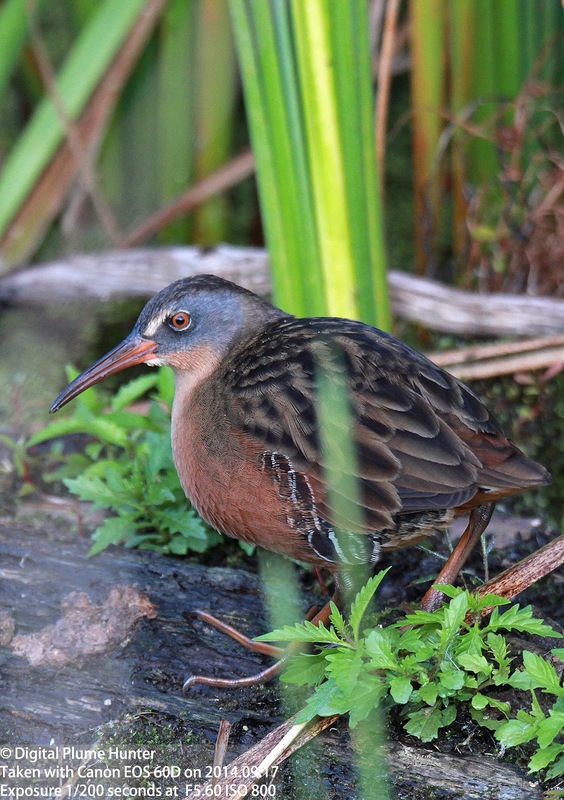 However, on the rare occasion that the Virginia Rail should, in an act of unguarded generosity, permit the fortunate birder to indulge in unobstructed views, they will be immediately struck by the deep earth-tones, the red eye, white supercilium and grey cheeks that all lend an unparalleled visual splendor to this striking marsh bird. 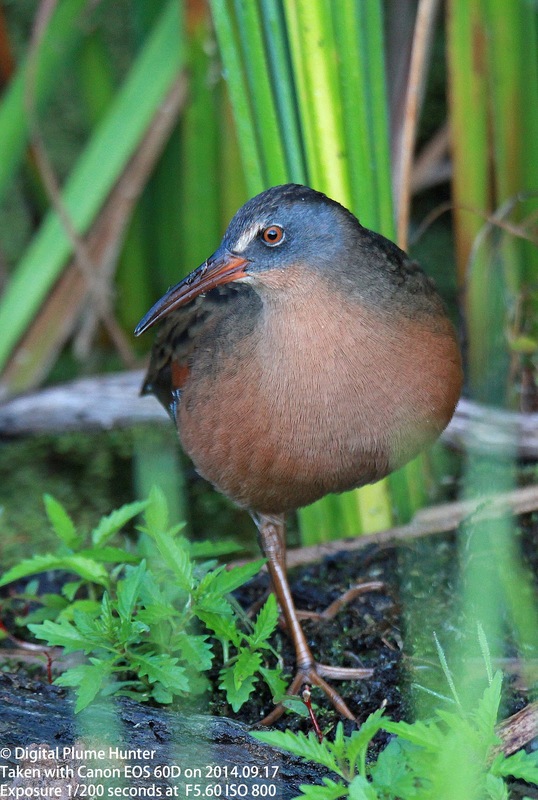 Here observed in juvenal plumage, the Common Gallinule (like the Coot) is a largely aquatic rail. 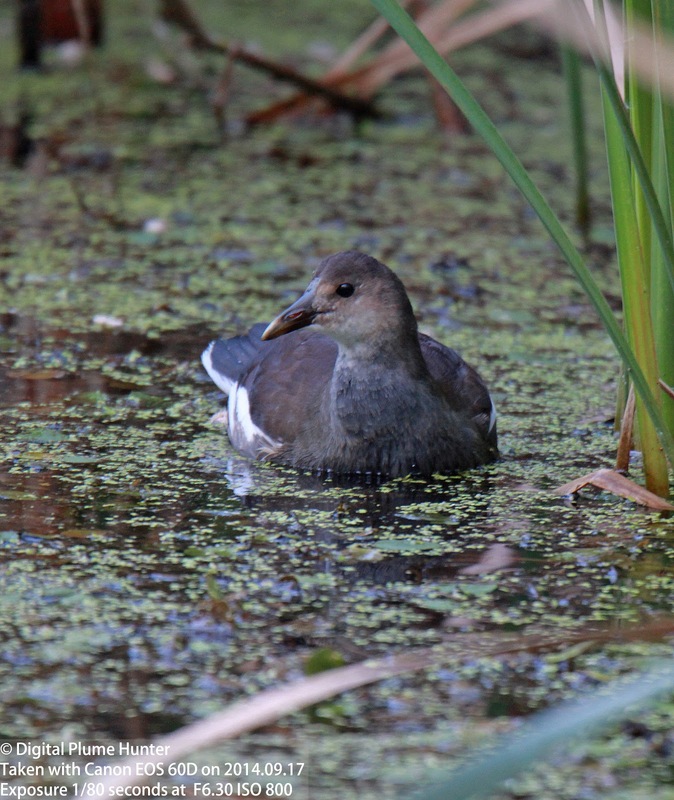 It is one of 10 Gallinule (or Moorhen) species worldwide including the Dusky Moorhen seen here in the Southern Hemisphere. 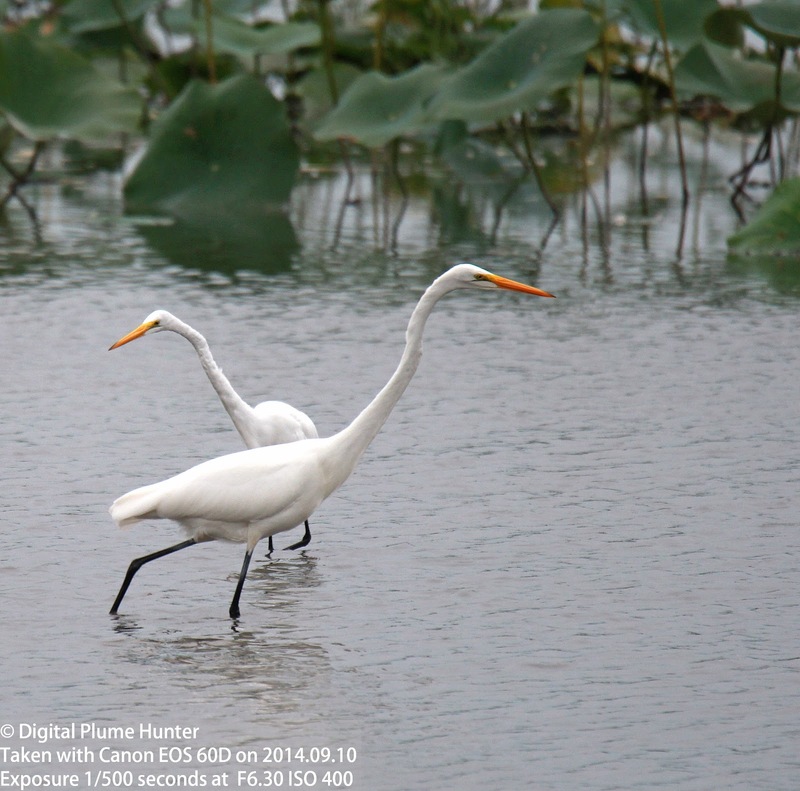 Great Egrets at Sterling State Park were taking advantage of low water levels to fuel themselves for a long journey to more reasonably temperatured climes. 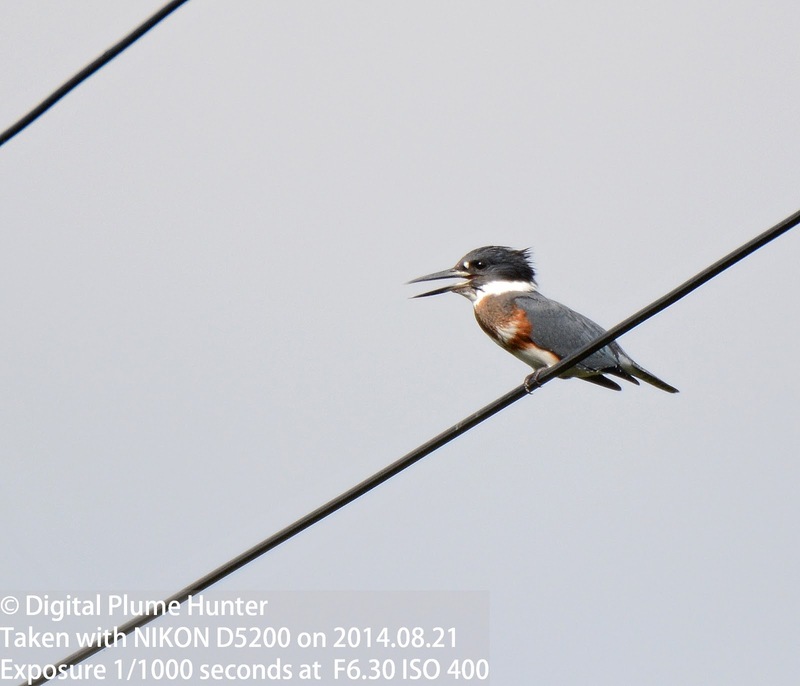 Both juvenile and adult Green Herons were on the move as well. 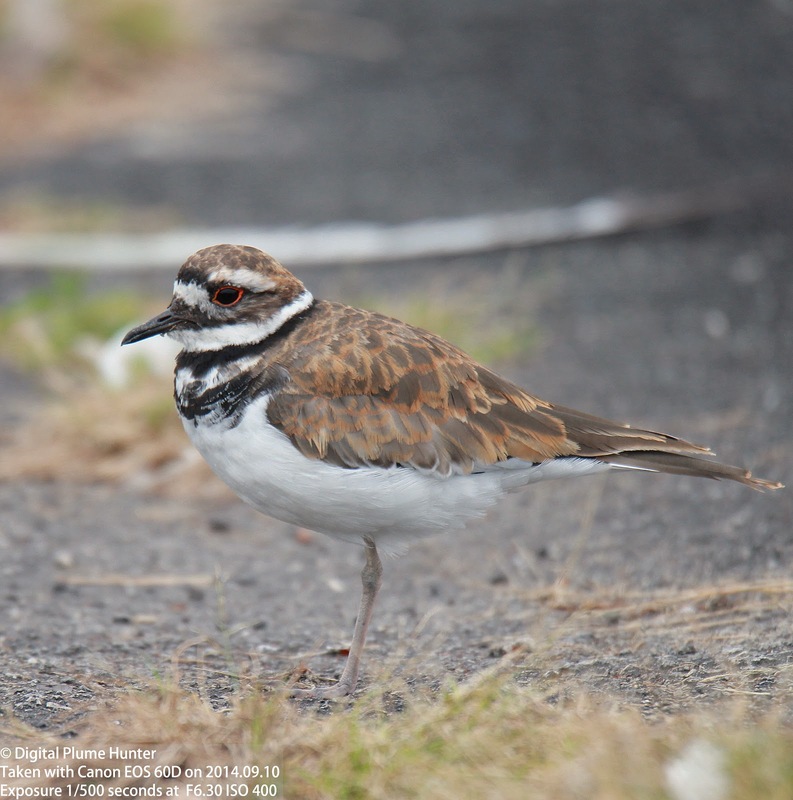 The Killdeer is seen here taking advantage of the vacant parking lot to roost. 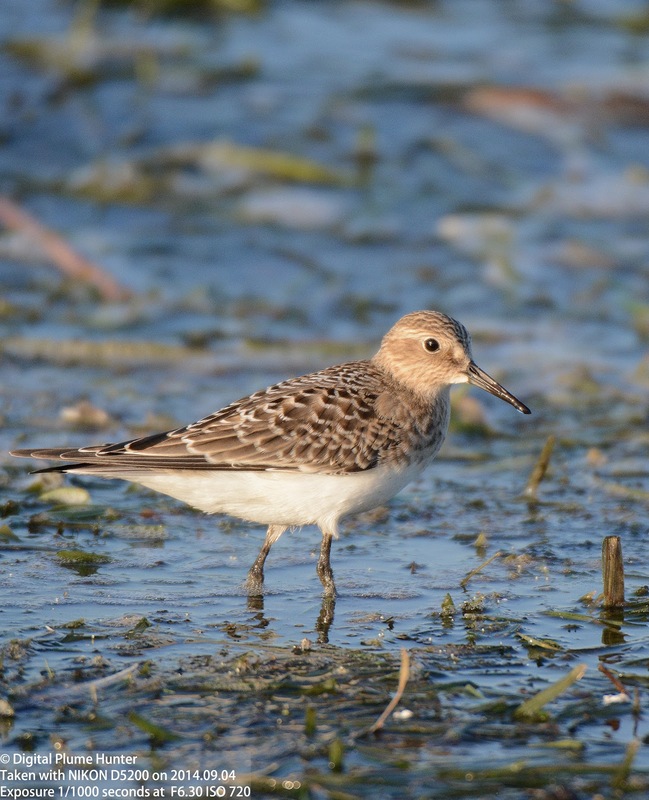 Fall migration affords many possibilities for observing birds in passage and while the observation of shorebirds and warblers dominates, Marshes and Wetlands must not be overlooked. 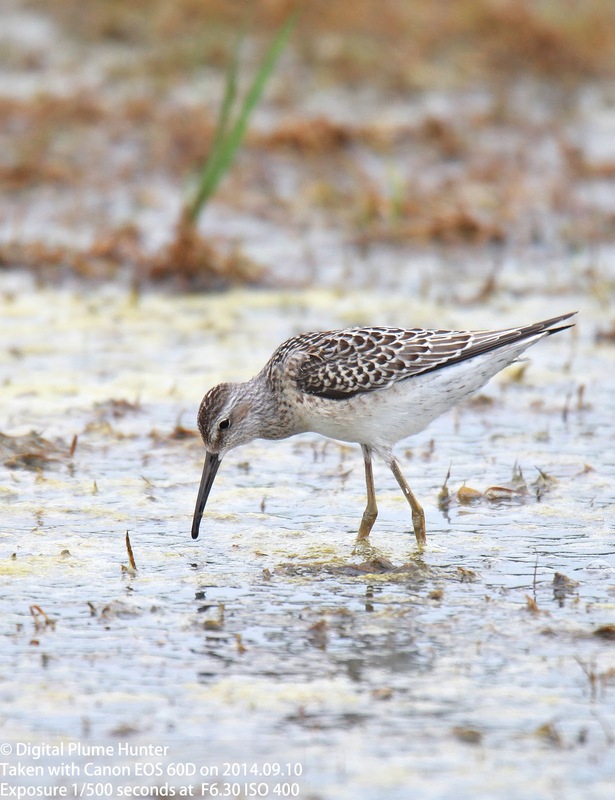 Named by Elliott Coues after the giant of Amerian birding, Spencer Fullerton Baird, Baird's Sandpiper is a passage migrant through the US. 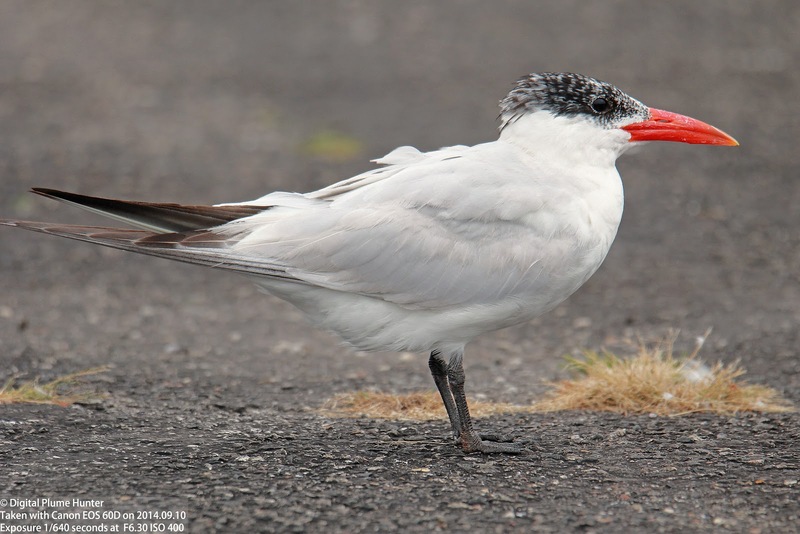 It breeds in the high Arctic and winters as far south as Tierra del Fuego, at the very tip of the South American continent. 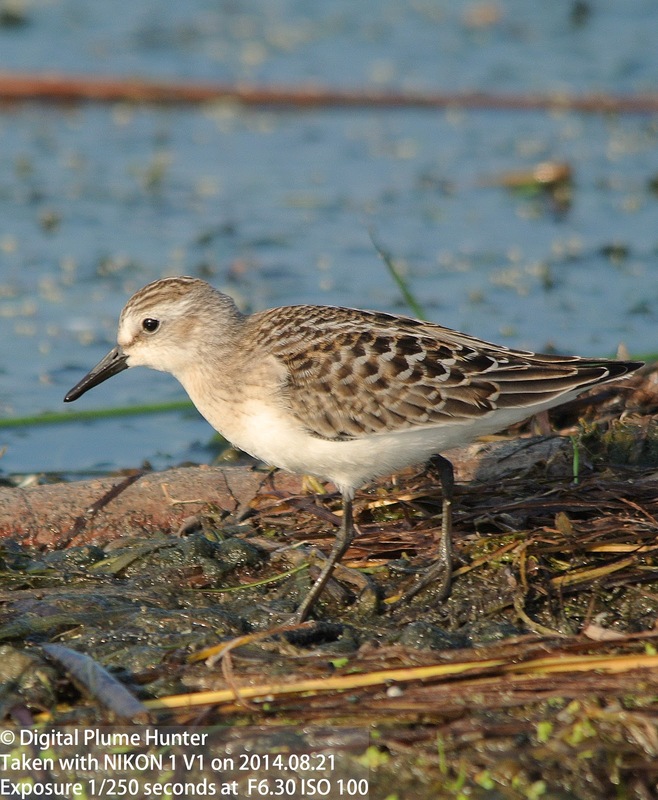 Barid's Sandpipers mainly use a central flyway down the middle of the country which gradually fans out as they travel South; eventually spreading from Baja California to the Gulf coast. 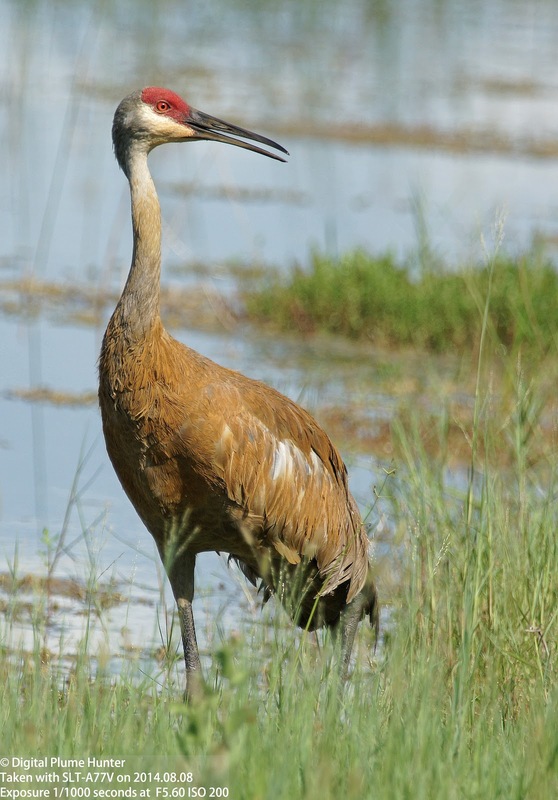 I have not observed them in Southwest Florida, however, but understand they are sometimes reported from Merrit Island NWR and the Panhandle. 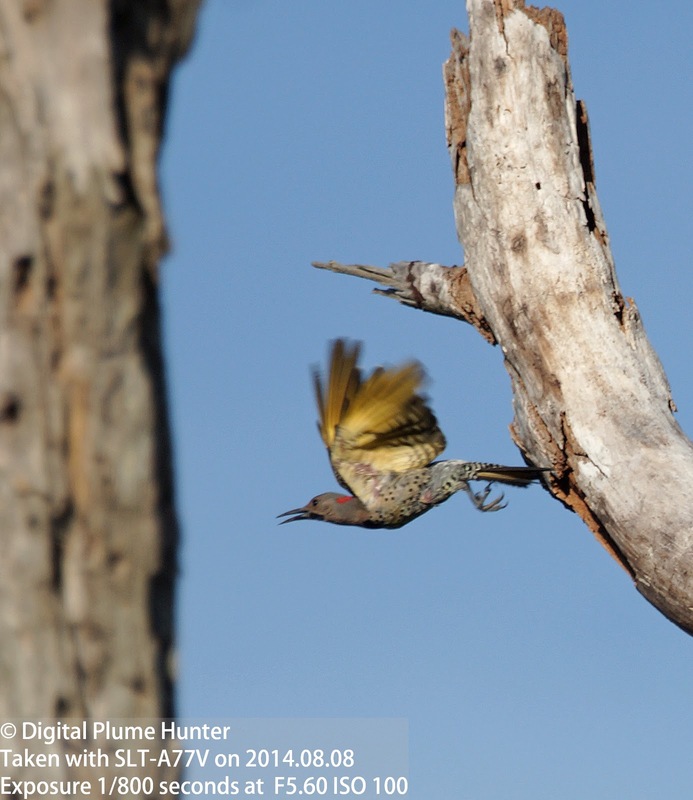 Identification characteristics to look for include remarkably long wings and a dark rump. Indeed, the primaries will extend noticeably beyond the tail when the wings are folded (see first photo). 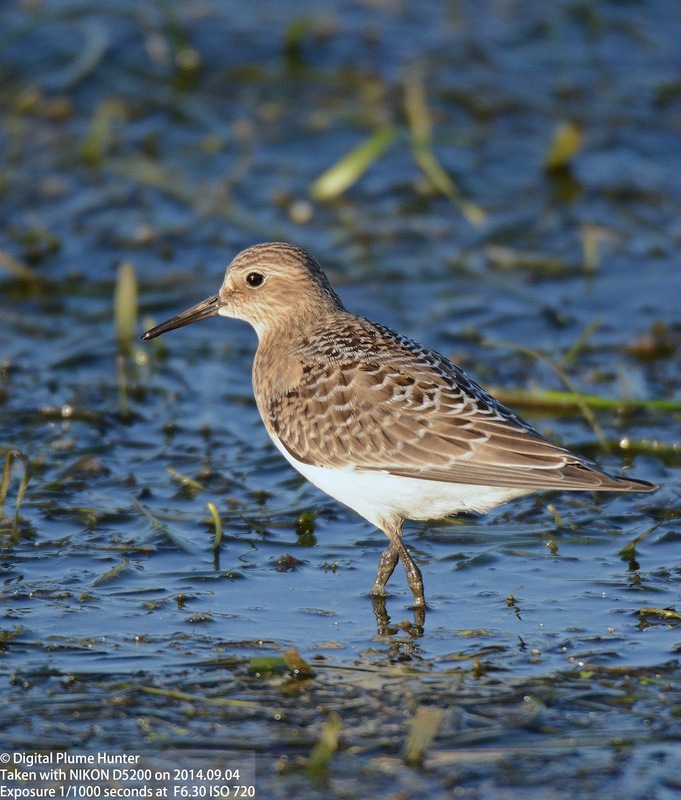 The only other sandpiper that shares this feature is the White-rumped Sandpiper -- but, it has a white rump instead of a dark one. 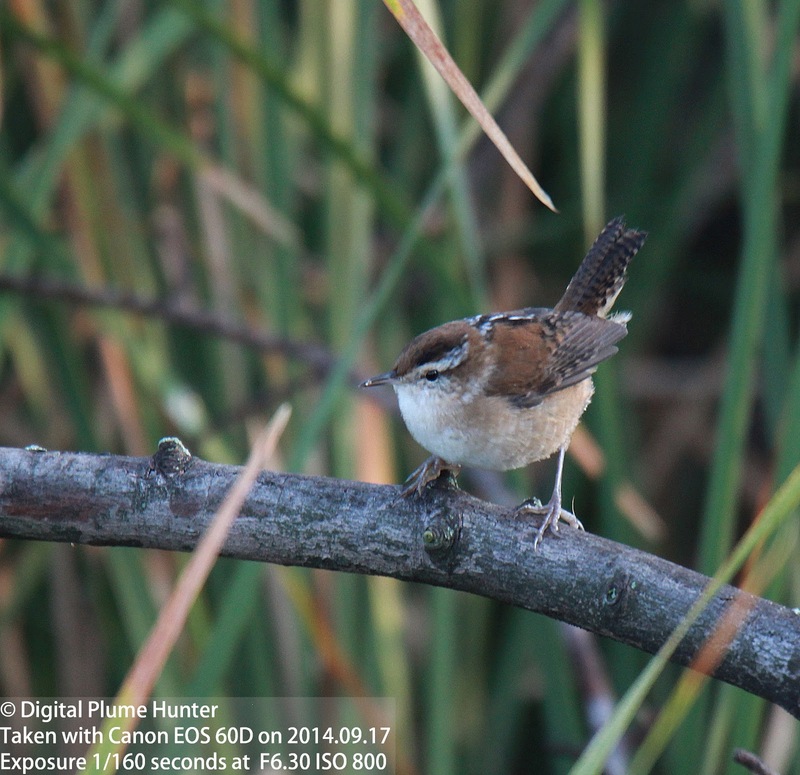 The light brown streaking on their face and breast and the white edges to their feathers are also distinctive. 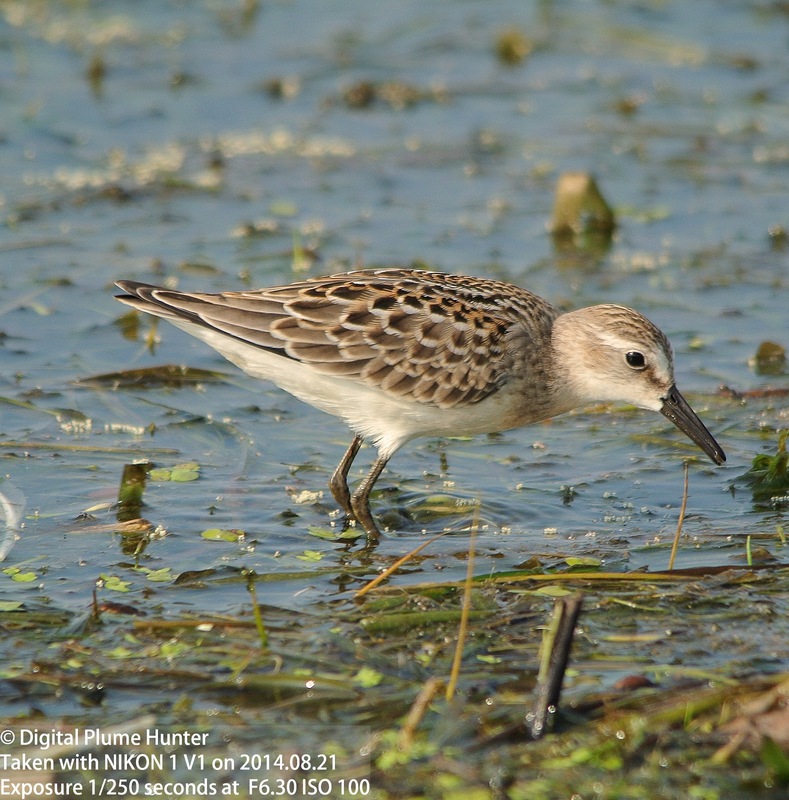 Our next shorebird is Semipalmated Sandpiper. 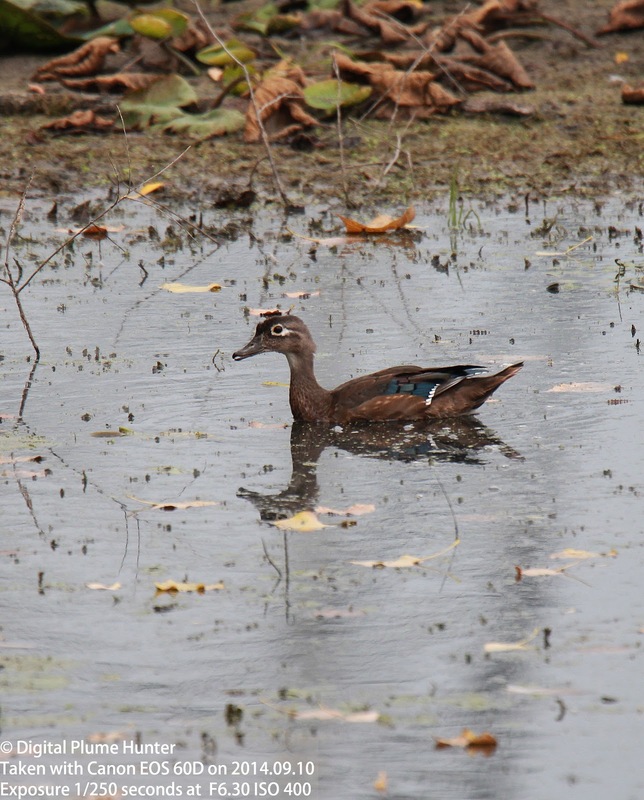 A species this blogger was surprised to learn is under intense ecological threat. 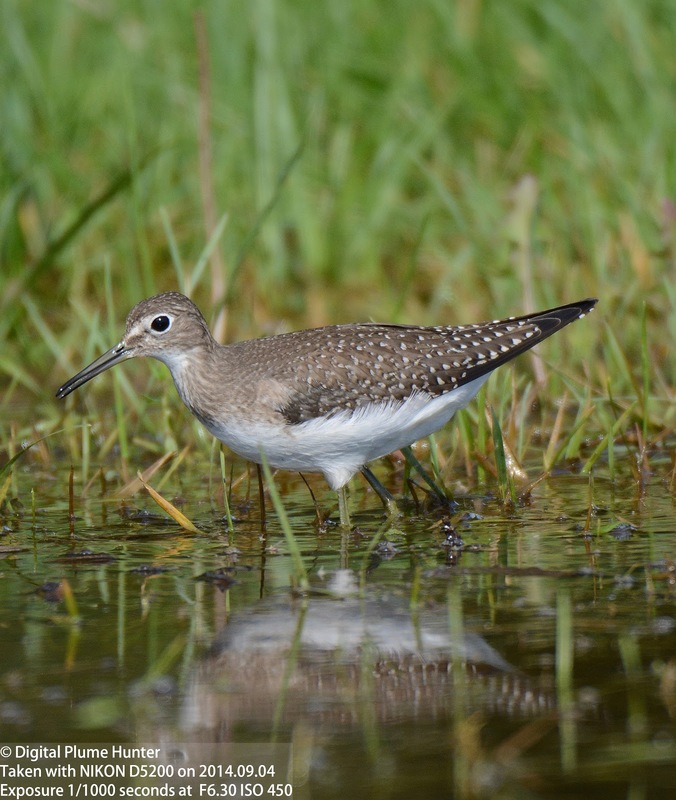 Recently estimated to number in the millions, this small sandpiper has now been classified as "Near Threatened" as a result of a huge decline in its population -- primarily suffered in its wintering grounds in Suriname and adjoining countries in South America. 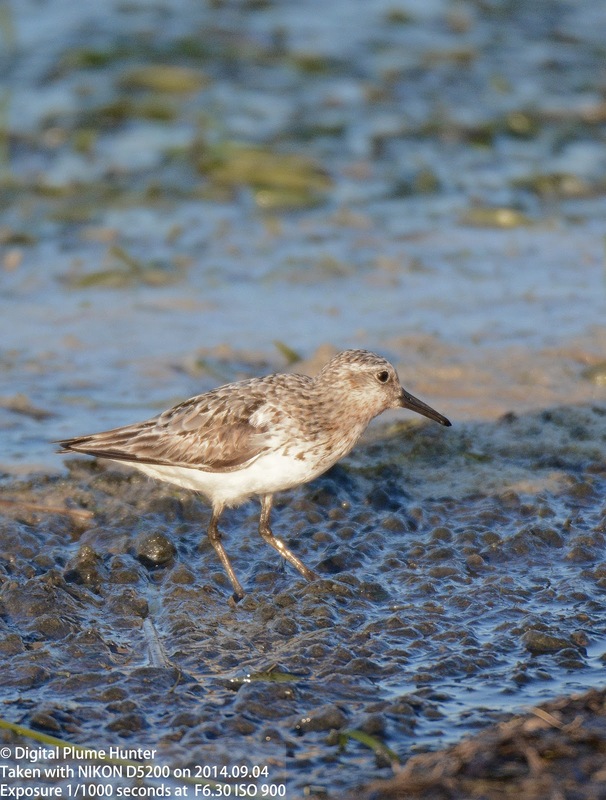 This tiny sandpiper, like the Baird's, is found in the Eastern half of the US only as a passage migrant -- neither breeding nor overwintering in this country. 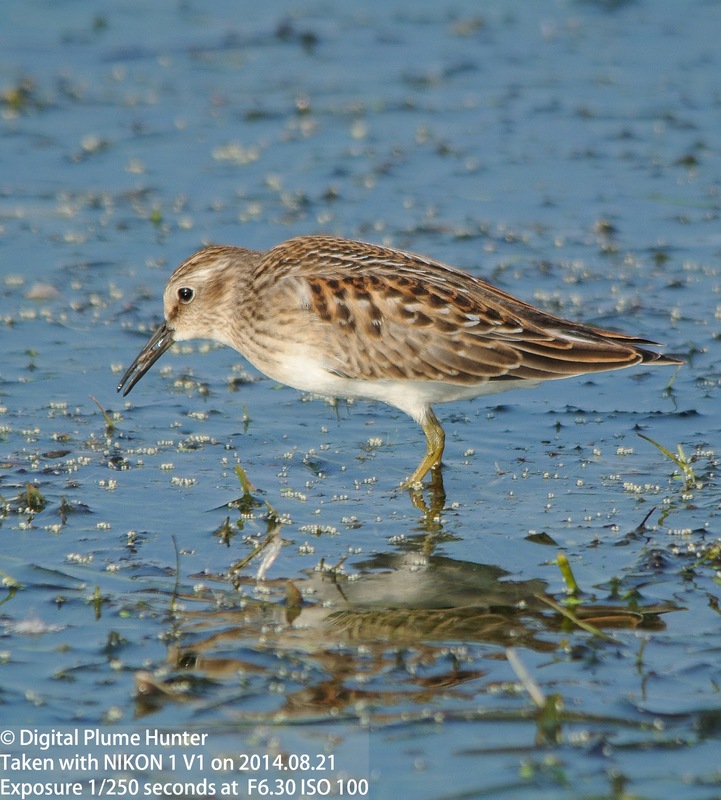 Distinguished from the Semipalmated by its yellow legs and finer bill, the Least Sandpiper is an abundant migrant and overwintering peep in the US. 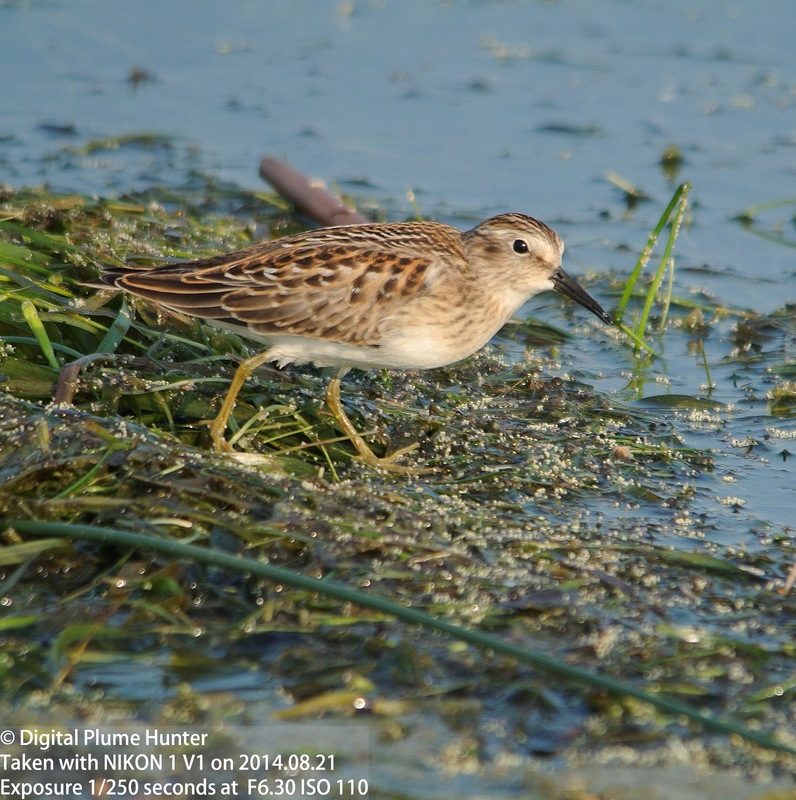 Least Sandpipers are the smallest shorebird on the planet -- no bigger than a house sparrow. 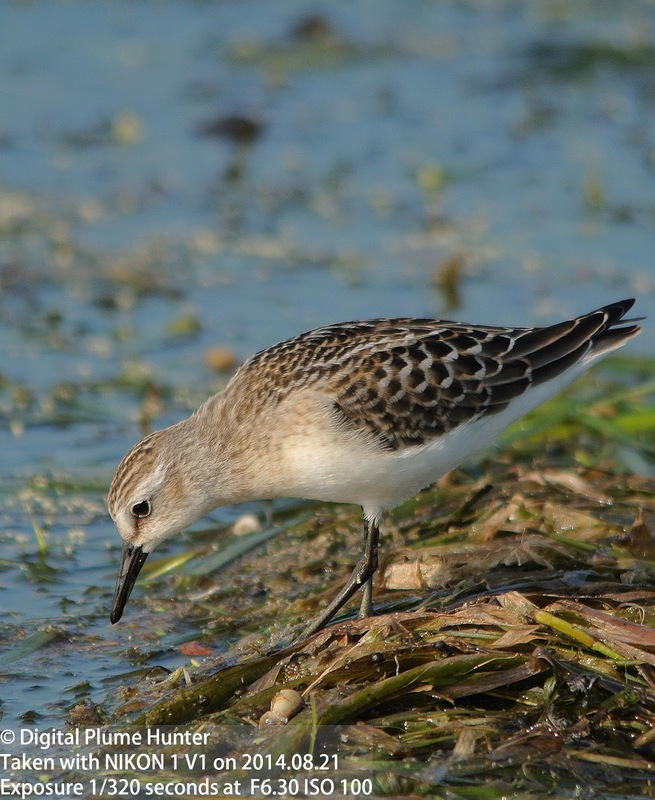 Unlike the sandpipers reviewed so far, which are exclusive to the Americas, the Sanderling is a global shorebird. 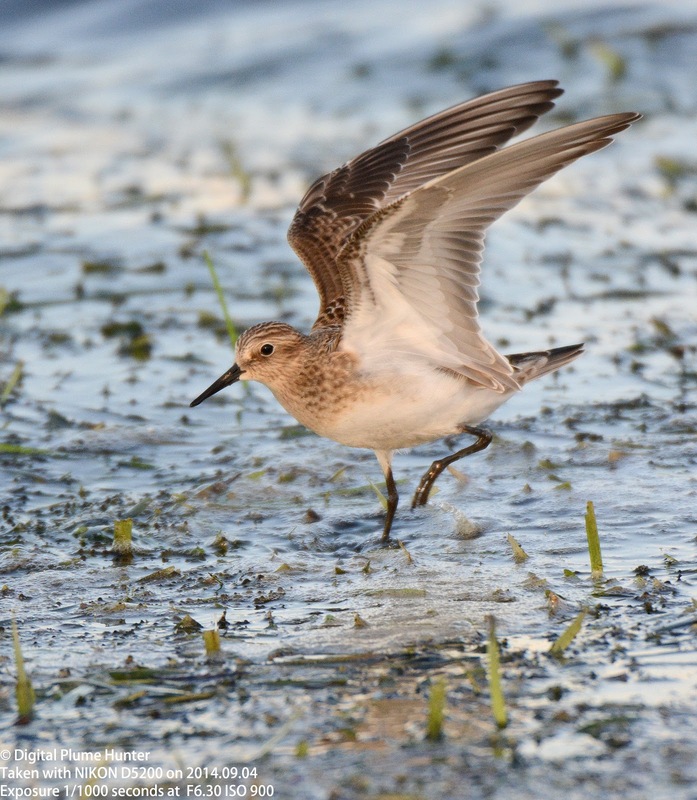 This pale and plump shorebird is known for forming large coastal flocks in the winter; indeed the sight of foraging Sanderlings at the beach is a familiar, nay ubiquitous, feature at Florida's beaches in winter. 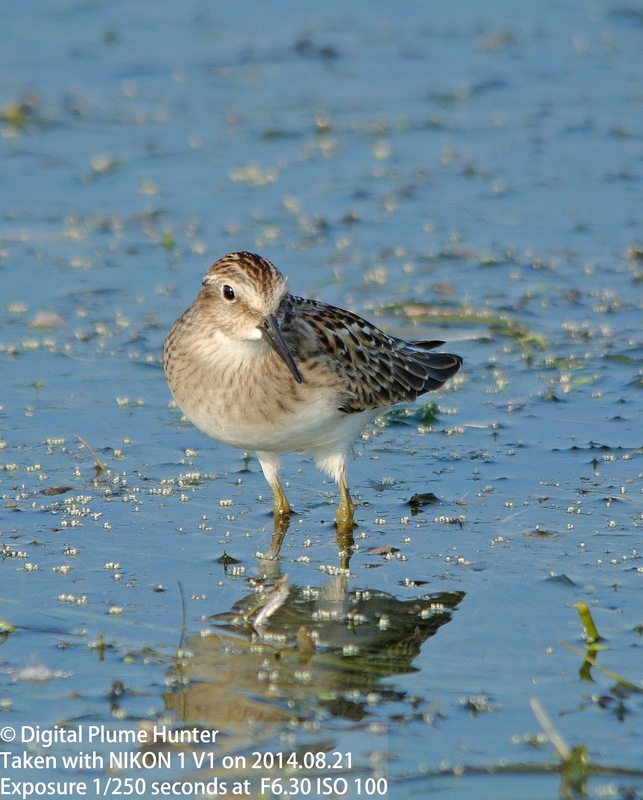 Usually regular in Fall at Lake St. Clair Metropark (see this post from last year), lakeshore habitat alteration by Park officials has made shorebird observation decidedly patchy this year at this venue with no reported Pectoral Sandpipers. However, a trip to Sterling State Park resulted in several, but exceedingly distant, sightings (see above). 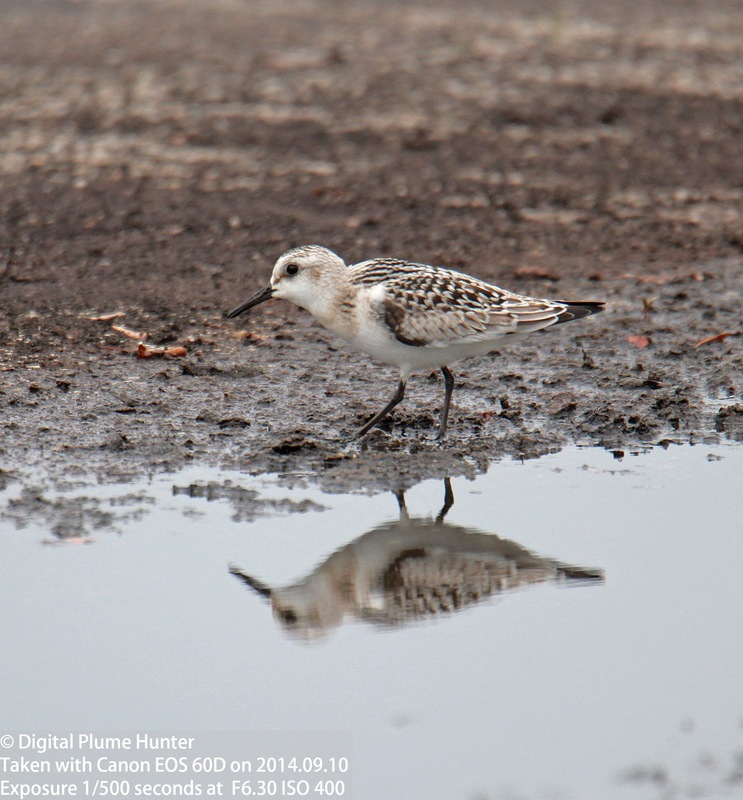 Shorebird observation offers many rewards not least of which is a fuller appreciation of the challenges that our peeps face in their formidable migrations -- with some journeys exceeding 9,000 miles! 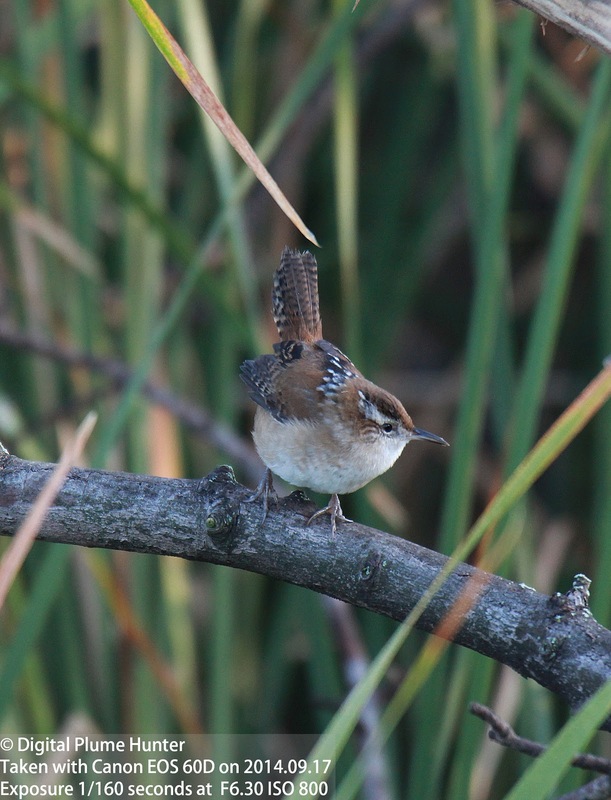 In the Fall, the Spring splendor of warblers in bright colors and crisp tones turns into a migrating melange of the dull, drab and ambiguous -- a perfect excuse to focus on migrating shorebirds instead! 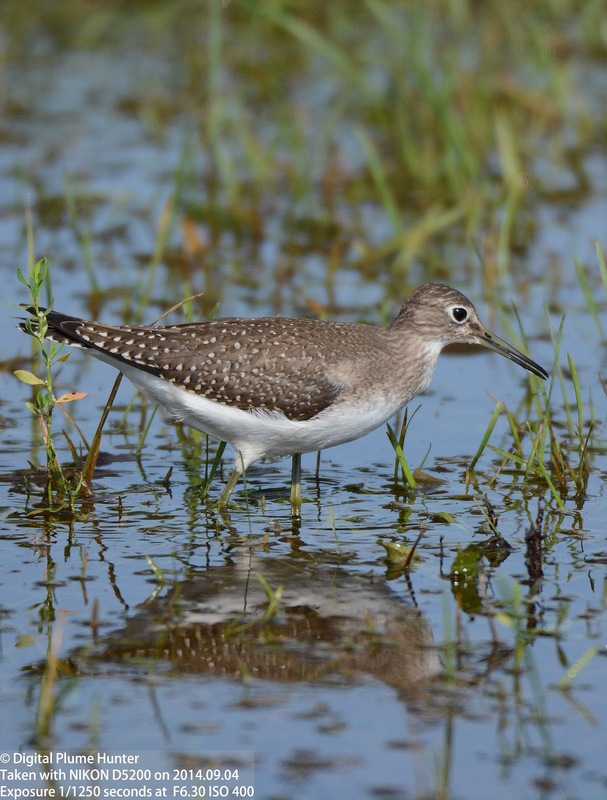 We review 4 migrating sandpipers -- all with yellow or greenish legs: Lesser Yellowlegs and Stilt, Solitary, and Spotted Sandpipers. 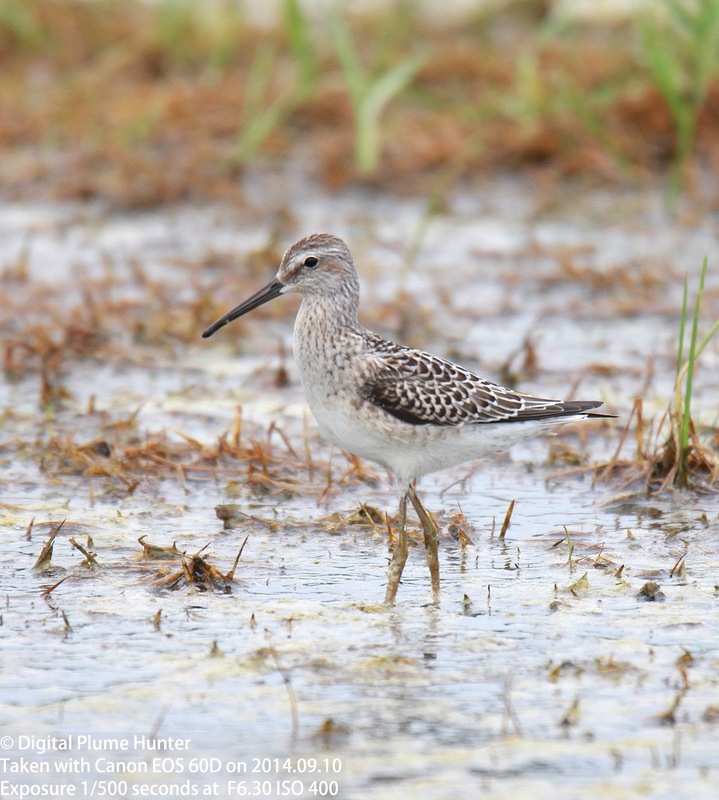 The Stilt Sandpiper is somewhat odd looking -- it has the characteristic bill of a Curlew Sandpiper (a speices not normally observed in the US, but seen in this blog at venues in India or Australia) and the body and legs which are reminiscent of Lesser Yellowlegs (see a comparison between the two here as observed in juxtaposition in Puerto Rico). 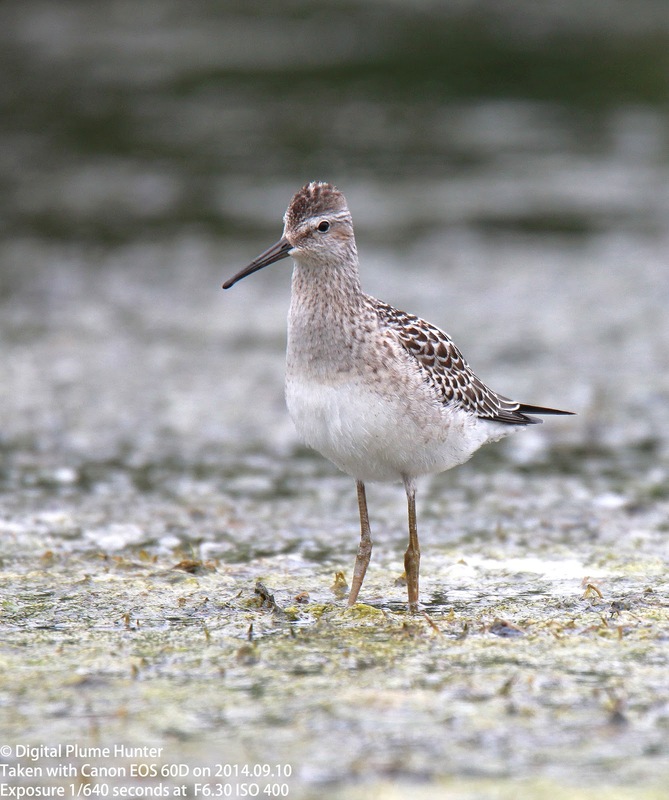 This gives the Stilt Sandpiper the overall appearance of a long-legged Dowitcher; but it is the Curlew Sandpiper that is considered to be the Stilt Sandpiper's closest relative. 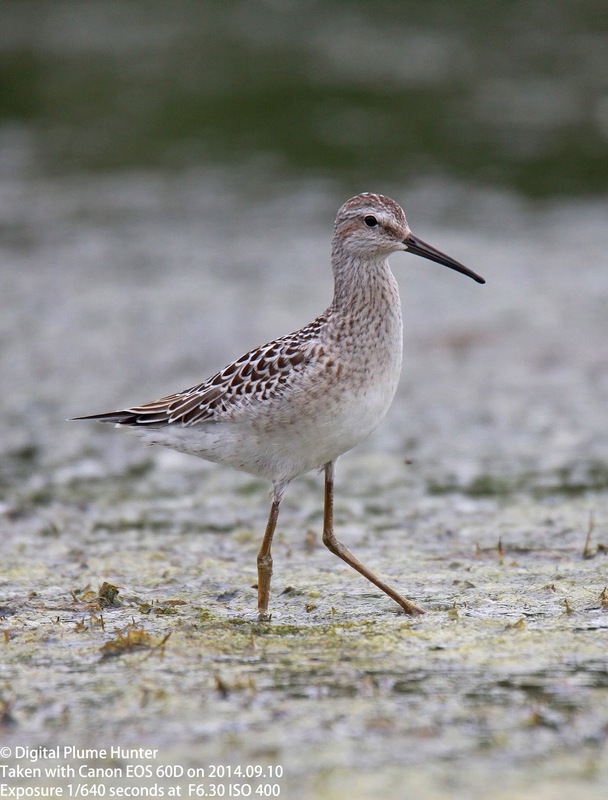 If you miss the Stilt Sandpiper in migration, you may yet see it in Winter. While its wintering grounds center around tropical America, the winter range does barely extend into Southern Florida. 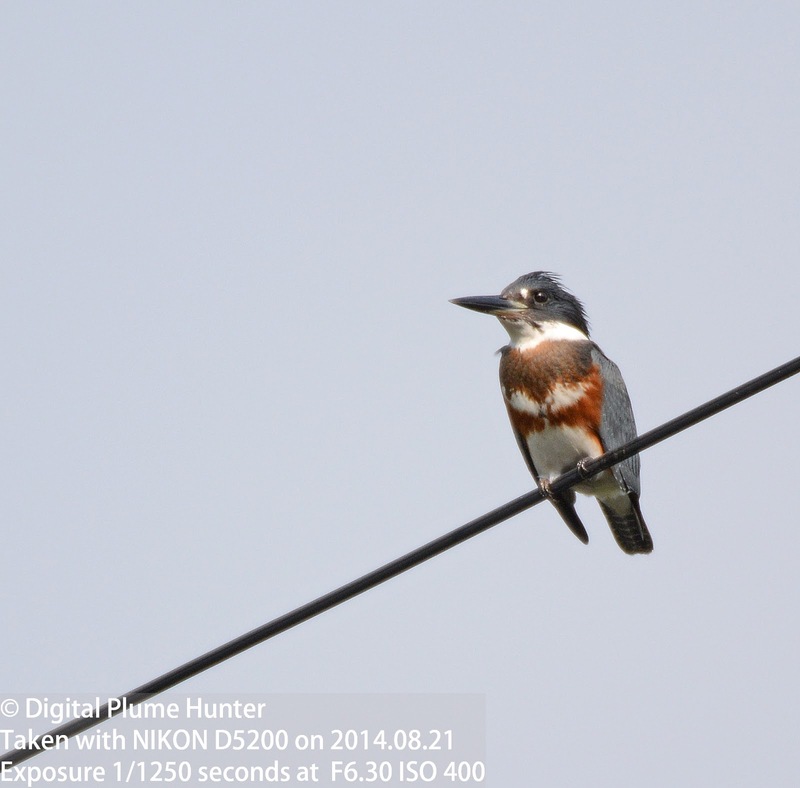 Indeed, this blogger has observed them at the STA-5 location during trips coordinated by Tropical Audubon. 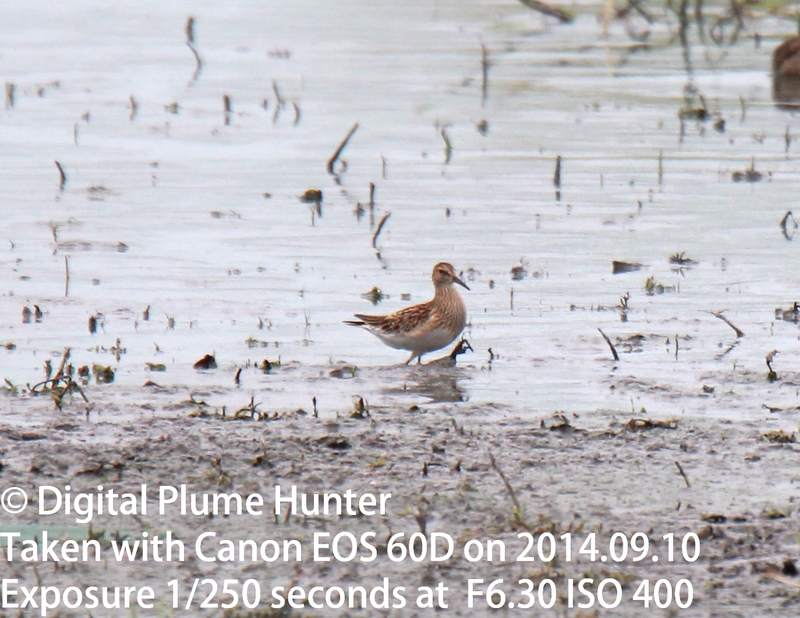 Of the 4 shorebirds profiled here, it is only our next, the Solitary Sandpiper, that is not seen in the US in Winter. 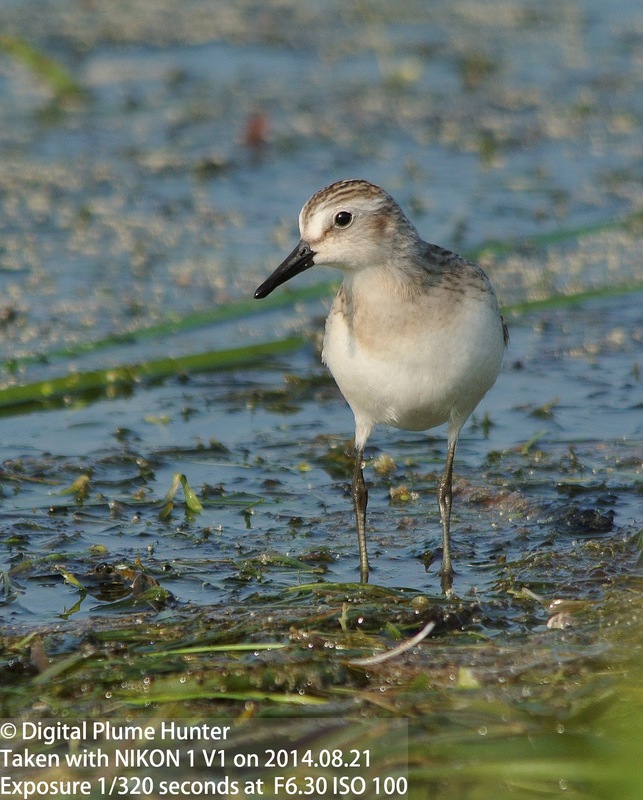 Sharing the greenish legs of the Stilt Sandpiper, the Solitary's closest relative is the Green Sandpiper of the Old World. The prominent eye-ring, spotted back and olive bill are all distinctive. 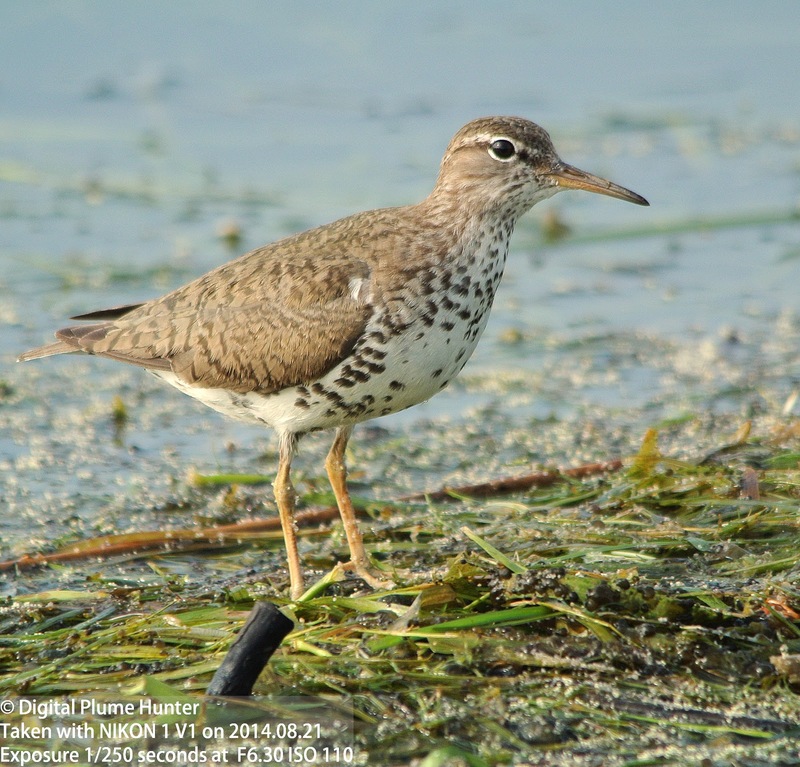 Usually found alone or in small groups, it is this behavioral characteristic that betrays the origin of its name (although, truthfully, perhaps many more sandpiper species would fall within the ambit of this logic -- eg., Spotted Sandpiper). 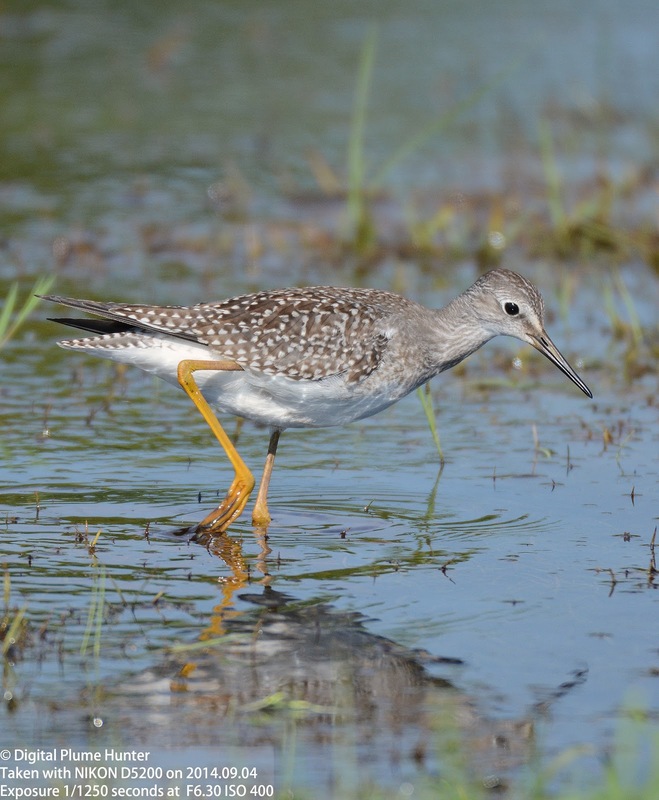 The bright yellow legs, spotted back and less prominent eye-ring distinguish it from the Solitary Sandpiper. It is generally poor practice to draw taxonomic conclusions from similarity in nomenclature. 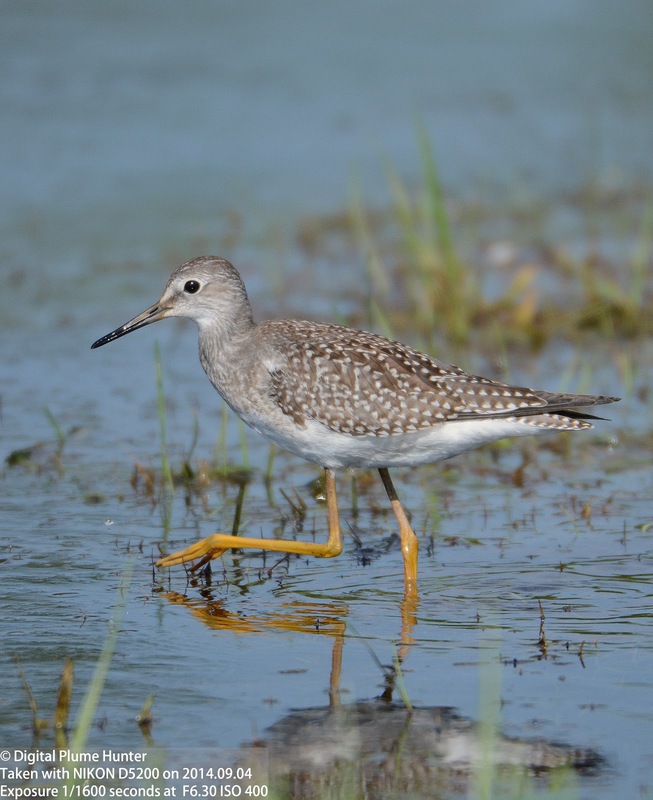 And, indeed, the Lesser Yellowlegs is not closely related to Greater Yellowlegs although the latter visually appears to be a larger version of the former. 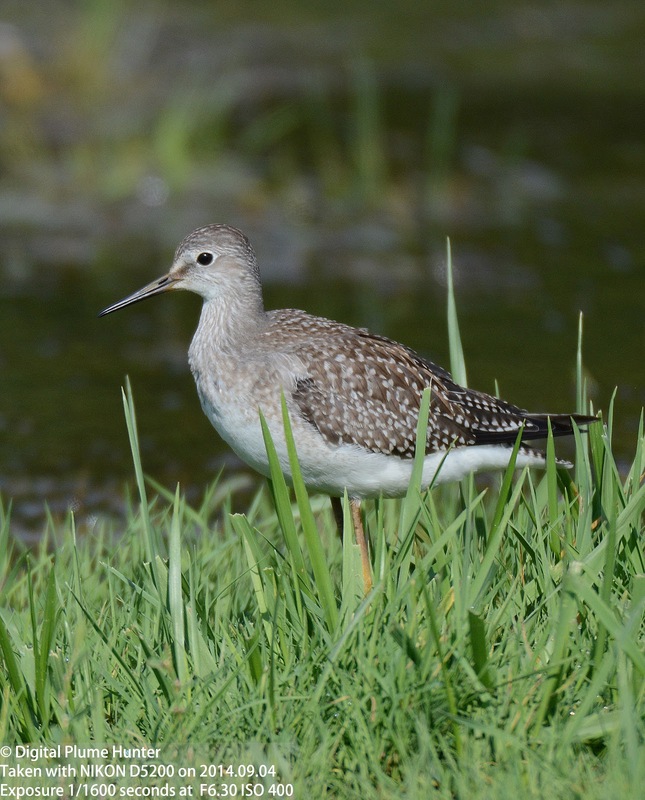 As a matter of fact, the closest relative of the Lesser Yellowlegs is the Willet. Who knew! 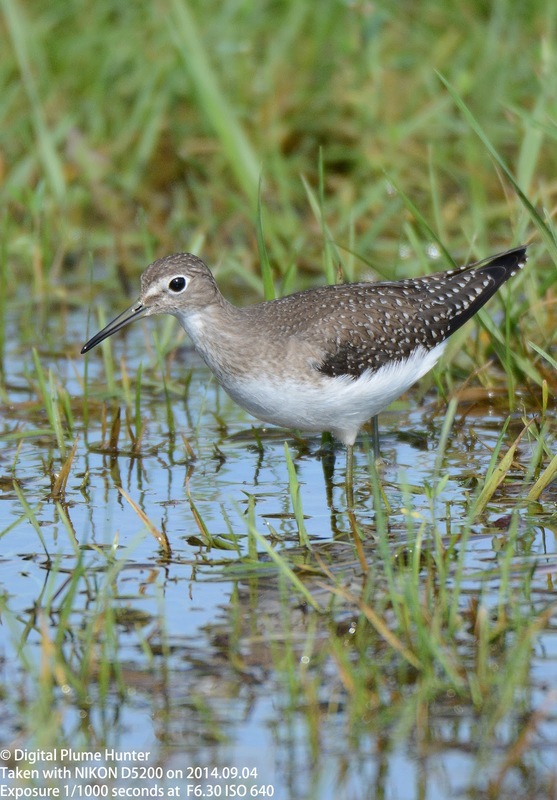 Unlike the other shorebirds profiled here that breed in the high Arctic, the Spotted Sandpiper breeds widely across the continental US and can be seen commonly wherever freshwater can be found. 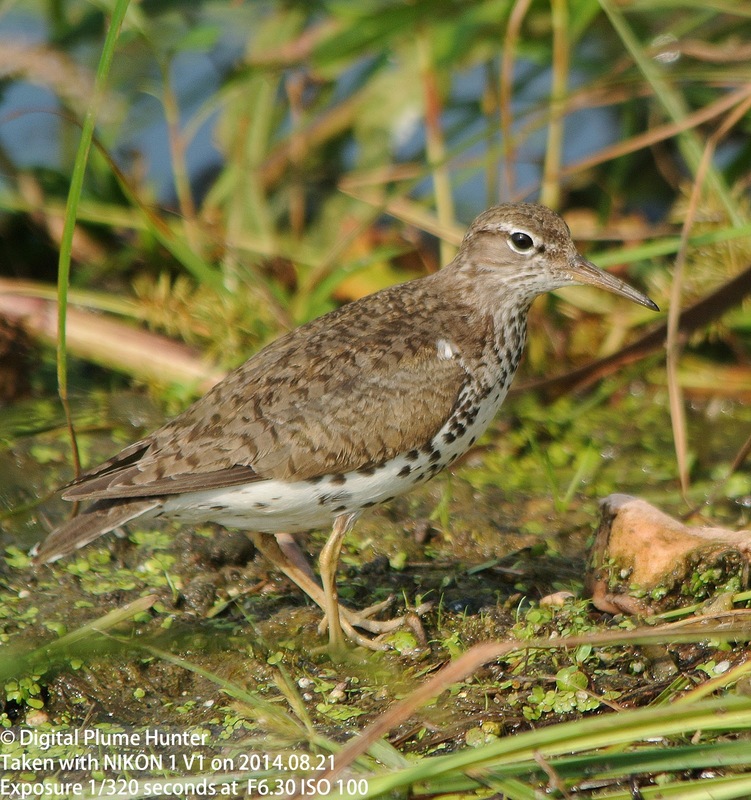 It is closely related to the Common Sandpiper of the Old World which looks very similar (excepting the spots). 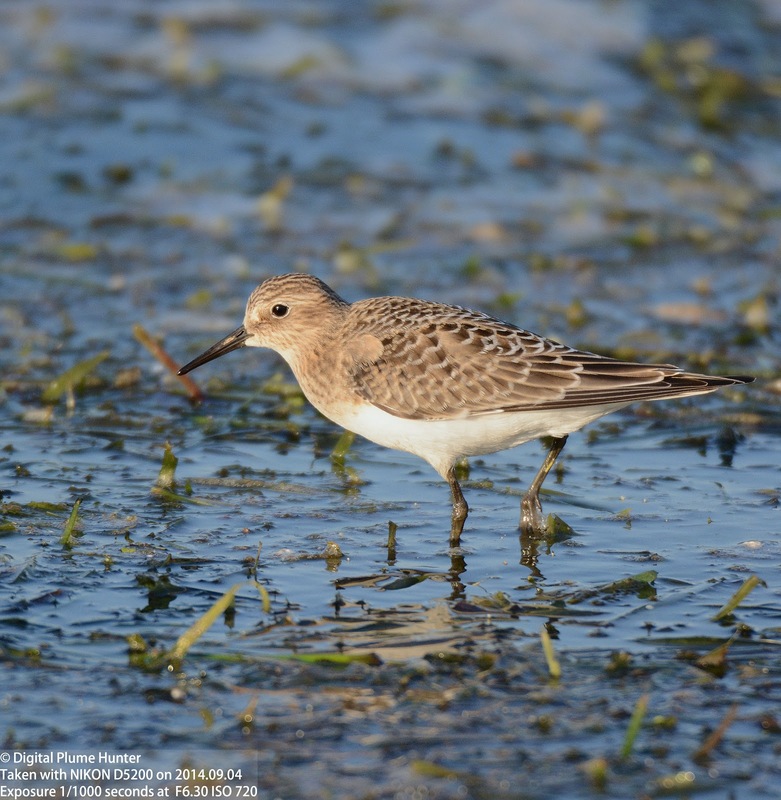 This group of medium-sized sandpipers with yellowish legs provides a wonderful example of how superficially similar shorebirds can yet be so different in behavior, habitat and distribution. 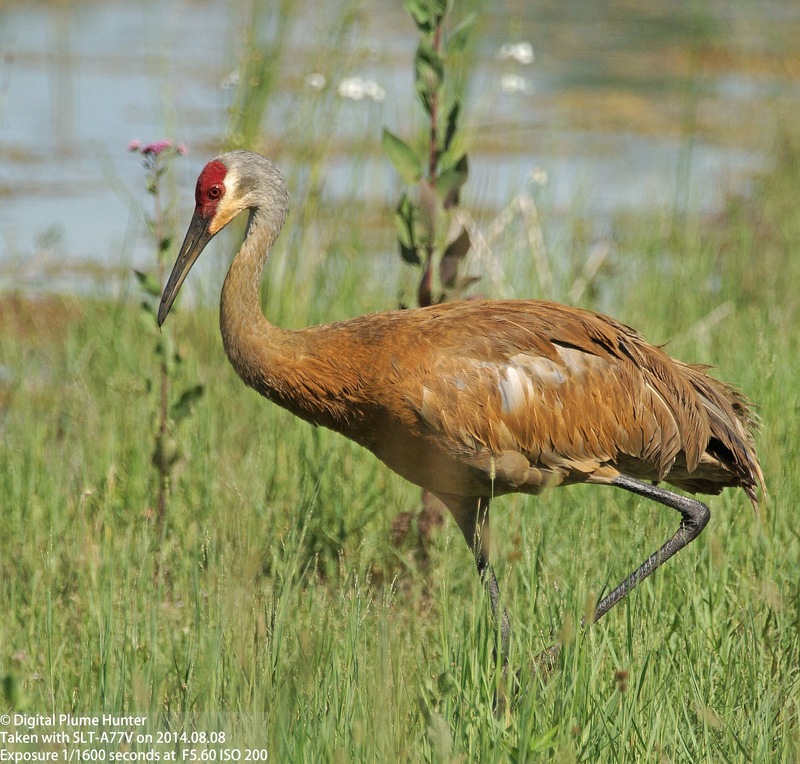 The distribution of bird families in the US is not even across the Eastern and Western halves of the continent. 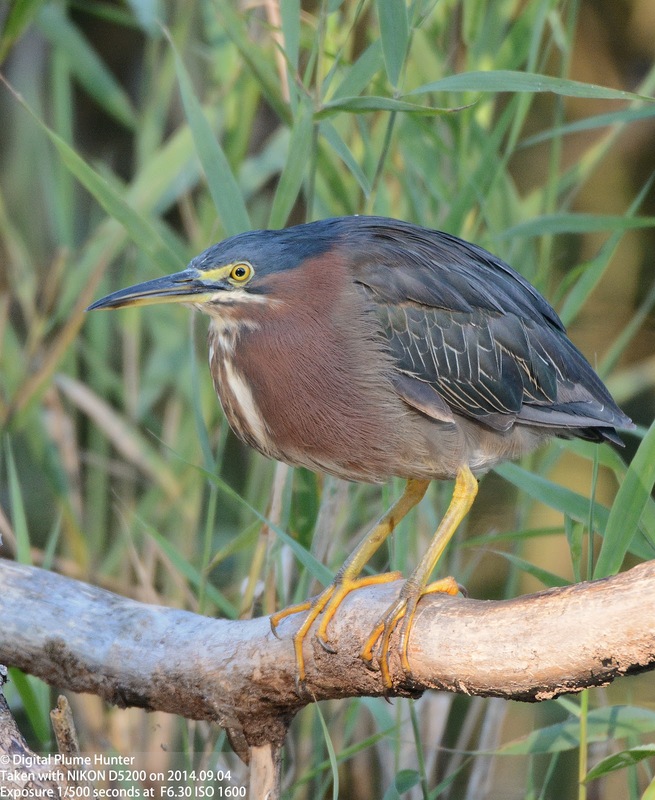 We, in the East, are considerably richer in Warblers, Herons, and Shorebirds. However, the West wins in Thrashers, Tanagers and Quail. For example, of all our Quail species -- Montezuma, Scaled, Gambel's, Mountain, California and Northern Bobwhite -- it is only the latter that is found in the Eastern US. And, seeing our only Eastern Quail -- the Bobwhite -- is not as easy as it used to be. 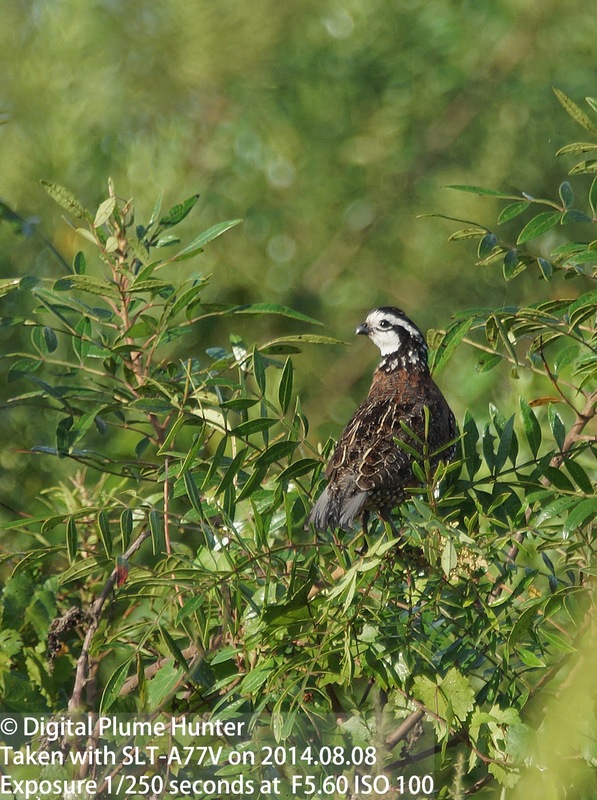 In fact, since the '70's, the Bobwhite has lost over 80% of its population due to the same familiar yet fatal reasons that caused the extinction of the Passenger Pigeon a hundred years ago: habitat loss and hunting. 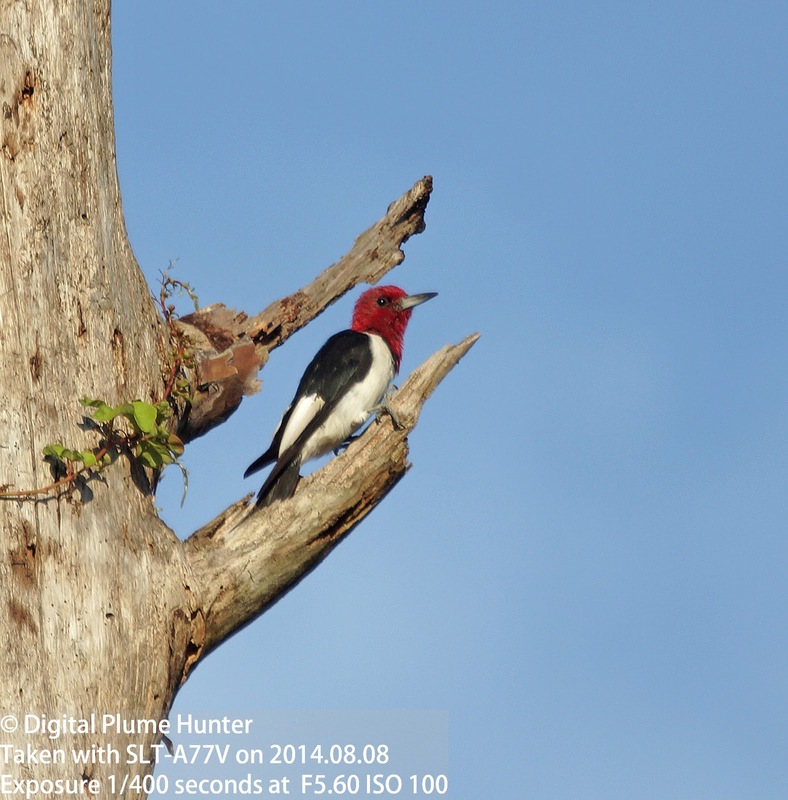 Thus, thanks to an invite from Bob Pelkey, I jumped at the opportunity to observe our only Eastern quail as well as observe the spectacular Red-headed Woodpecker at a newly discovered hotspot in Lehigh Acres, FL. 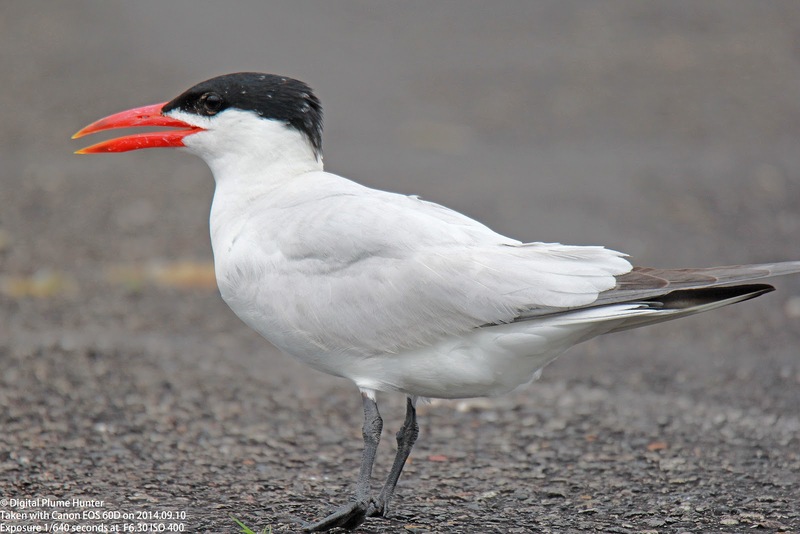 The male of the species is a real stunner -- the face is white and boldly marked in black while the upperparts are richly patterned in chestnut and black. 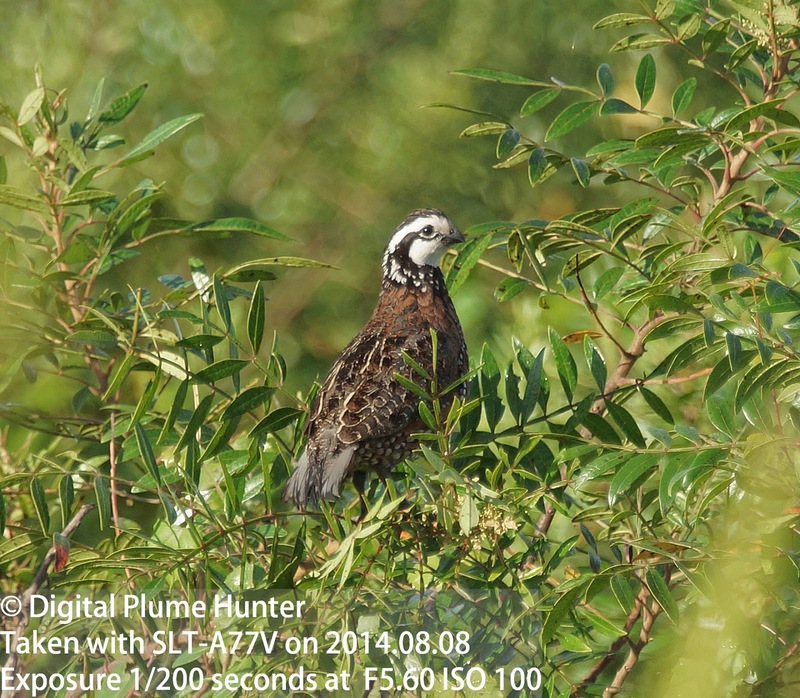 However, Bobwhite are shy birds and it is infinitely easier to hear the distinctive two-tone "Bob White" whistle of the male than to observe them out in the open. Having dipped on Montezuma Quail (but not with Scaled Quail) in Texas earlier this summer (see Big Bend Post here), it was a real treat to observe my second quail species of the year. 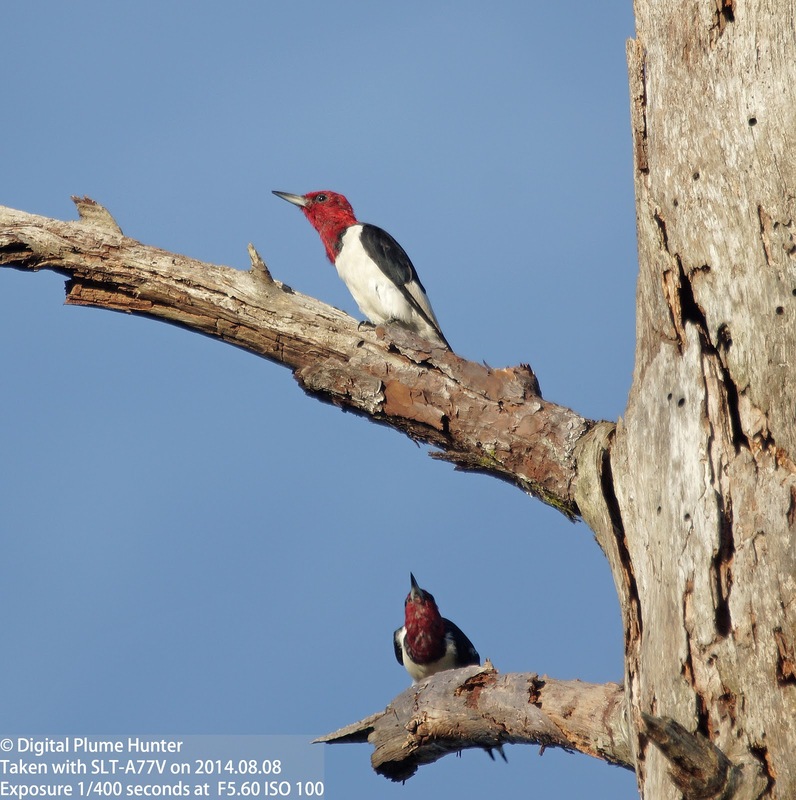 Our most striking woodpecker, the Red-headed is a real stunner with its white, black and red color scheme. 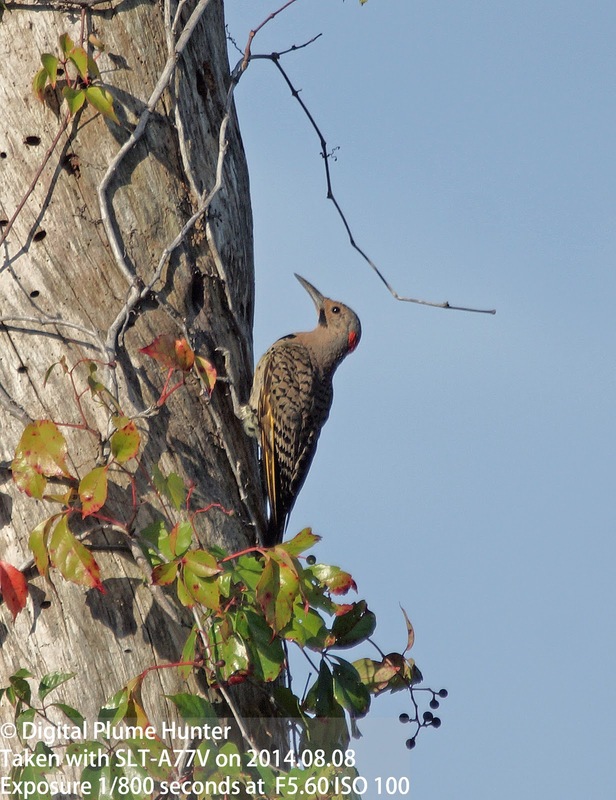 It is unusual in many respects -- it is not sexually dimorphic (unlike our other woodpeckers) and it also an unusually eclectic diet consisting of nuts, fruit and insects -- the latter it not only extracts by drilling into trees but also from the ground and air. 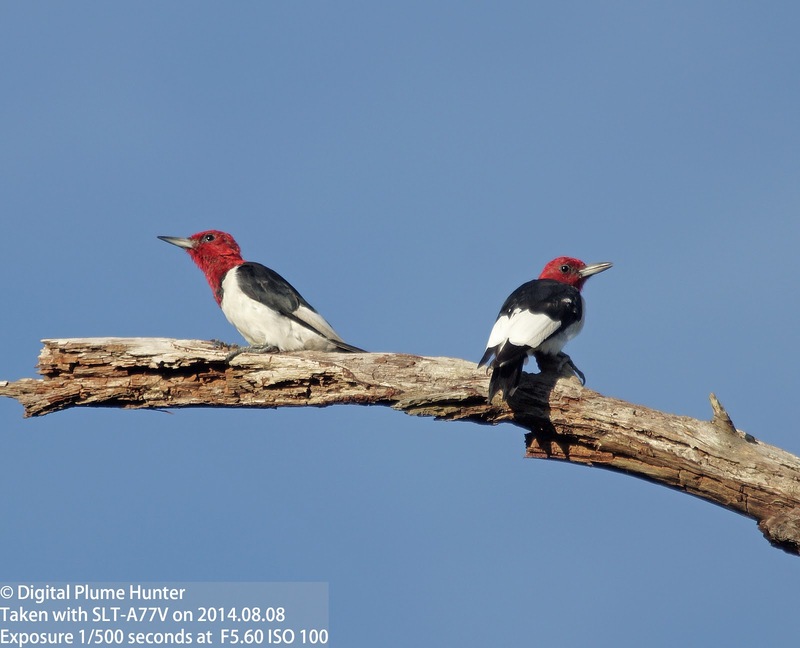 Sadly, the one thing the Red-headed Woodpecker shares in common with the Northern Bobwhite is its conservation status of "Near Threatened" -- having suffered a precipitous decline of 65% over the last 4 decades. 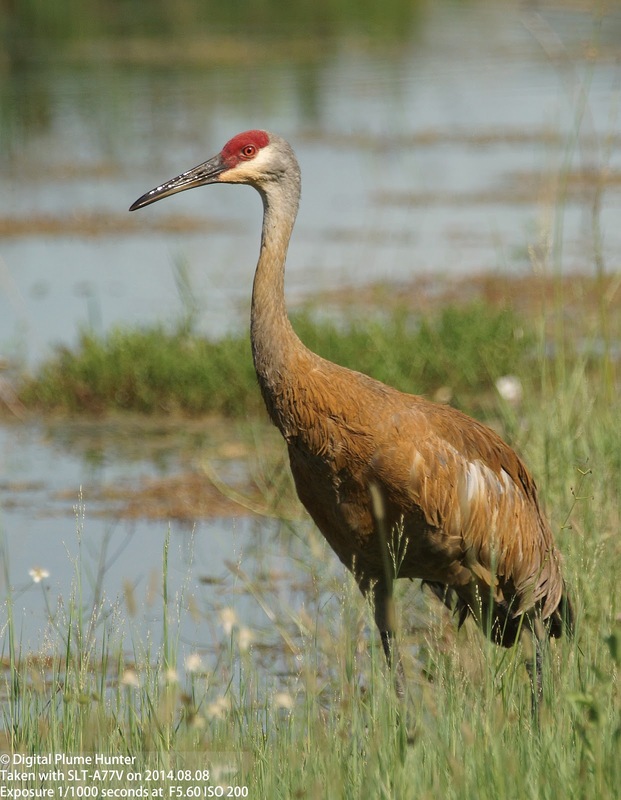 Being generally accustomed to seeing this species in Winter when they are draped in silvery grey, the prominent ocher coloration of the crane's alternate plumage was a nice surprise and a perfect way to cap an excellent morning of birding.